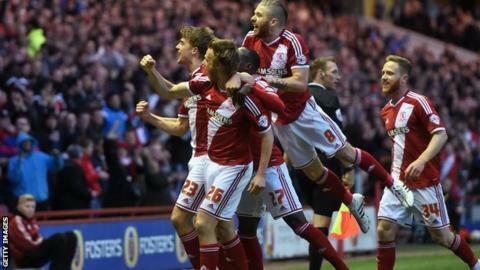 The Middlesbrough fans won the game for the team against Wolves, according to Boro boss Aitor Karanka. Promotion-chasing Boro beat the play-off hopefuls 2-1 at the Riverside on Tuesday and to guarantee their place in the Championship top six. "I want to say that our crowd have won this game," he told BBC Tees. "The first half was amazing and we played really, really well but in the second half they played very well and our crowd was brilliant." The former Real Madrid coach, who called on the fans to be more positive earlier this month, added: "They supported us through that last 45 minutes. "I can't say anything bad about the fans who come because they support us every single game and I can say thanks today." Boro travel to second-placed Norwich on Friday and Karanka is hopeful that his team will have learnt from recent defeats by promotion rivals. Watford and Bournemouth both recorded home wins over the Teessiders in recent weeks. "We have to learn from our games against Watford and Bournemouth and improve," he said. "We know what we did badly in those games and now we have two days to prepare everything. "The play-off position is guaranteed but we want more. The team showed that they want more so we have to keep going until the end."